In ancient times, gold coin rings were symbols of wealth and prosperity and were often worn with pride to symbolize membership in a certain brotherhood or society. Throughout the history of gold, gold coins were thought to hold a superior power in all business transactions and were readily preferred over paper money that could be easily forged and were prone to considerable wear and tear. Fitting precious metal coins into rings was a public declaration of wealth and importance in the society of its wearer. 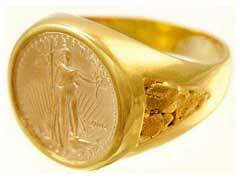 However, are gold coin rings a sound investment or they are simply souvenirs that do not hold significant value? Most professional collectors do not consider gold coin rings the best gold investment as they believe that as soon as a coin is fitted into a ring, it loses its collector value. The best way of describing it is making a wall tapestry out of a Picasso’s painting. Same holds true for any other type of jewelry like, for example, gold coin pendant. Before you decide to turn you prized gold dollar coins into rings, know the actual numismatic value of your coins. The process of fitting a coin into a ring setting might ruin its integrity, shape and surface. If your coin holds a special sentimental value to you and you would like to be able to actually wear it, choose fitting methods carefully. Avoid soldering a coin into any ring parts; good jewelers will fit it without having to bond it to preserve the integrity of your coin. If you are looking for a numismatic value in coins, gold coin rings are definitely not the way to go, however, there are some rare exceptions when coin jewelry is prized for its exceptional artistic beauty and craftsmanship. Before you invest money into any type of gold coin jewelry, know the current market price of gold, research the actual piece carefully and make sure you are buying from a reputable source to avoid fraud and fakes. Realizing the jewelry price contains a variety of added fees may convince you otherwise against buying such a frivolous piece of “investment”. So let coins be coins and preserve their value for years to come in your numismatic collection or turn to precious metals bullion coins or bars that provide superior value to cost ratio if you are seeking to invest in the rising prices of these metals.